What Day Of The Week Is August 10? 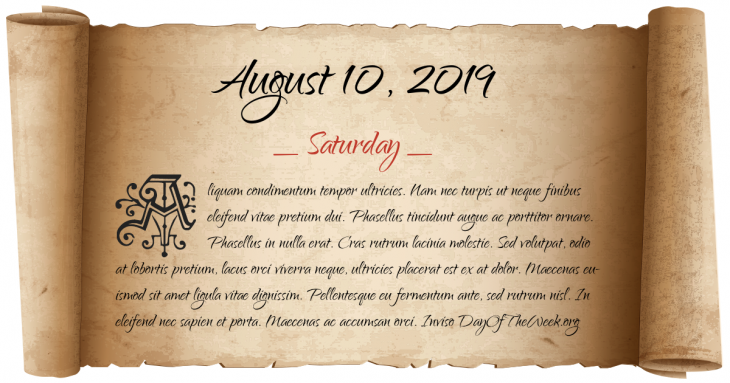 August 10, 2019 is the 222nd day of the year 2019 in the Gregorian calendar. There are 143 days remaining until the end of the year. The day of the week is Saturday. The term ‘the 10th of August’is widely used by historians as a shorthand for the Storming of the Tuileries Palace on the 10th of August, 1792, the effective end of the French monarchy until it is restored in 1814. Ferdinand Magellan’s five ships set sail from Seville to circumnavigate the globe. The Basque second in command Sebastian Elcano will complete the expedition after Magellan’s death in the Philippines. The Pueblo Revolt begins in New Mexico. Missouri is admitted as the 24th U.S. state. Russo-Japanese War: peace negotiations begin in Portsmouth, New Hampshire. Who were born on August 10?